The Stellenbosch area in the Western Cape is renowned for making world-class wines and producing some of the country’s most iconic rugby players, but another major attraction could be coming to town within the next few months. Stellenbosch FC have quietly gone about the business of earning straight promotion to the prestigious PSL and if they can hold on to their four-point advantage at the top of the NFD, the sleepy university town can expect Zamalek (Carling Black Label) to become the new regional beverage of choice. The club is on the verge of creating a slice of South African soccer history, with the Winelands area on the brink of welcoming the likes of Kaizer Chiefs, Orlando Pirates and Mamelodi Sundowns. Stellenbosch FC have one of the most astute coaches in the division with the experienced Steve Barker at the helm. Barker is no stranger to promotion and guided the University of Pretoria into the PSL in 2012. Barker then moved to AmaZulu for a stint, but in December 2017 he once again found himself in the environs of a world-class university establishment, replete with top-of-the-range training facilities, high performance centres and access to some of the finest medical teams in the country. Barker, the nephew of legendary former national coach Clive “The Dog” Barker, is one of the more affable men of football, and ranks up there with the likes of Gavin Hunt and Clinton Larsen for straight-talking, knowledgeable and passionate dialogue. The professionalism displayed at the club ahead of a testing month – the attitude of the management, coach and players – is all a testament to a team on the up. “We have an environment where players want to be here … the facilities make a huge difference and, even compared with PSL clubs, it stands out. But facilities are only as good as the attitude of the staff and players,” Barker says. “We are a club with huge ambition and I feel that we are becoming a destination club. That is why we are not worried about losing players if we get promoted, as sometimes happens to clubs moving up a rung. “Our biggest asset is our work ethic and humbleness and, while we have high hopes, we do not look too far ahead. We are more worried about where our next meal comes from,” he quips. But Barker and the team know that the next four matches will be critical to their future plans to build the club into a PSL staple. Barker is especially equipped to talk about how tough life can be in the NFD, particularly on the clubs battling to raise revenue over and above the grants they receive. “If you look around the globe, the most difficult league is always the first division,” he says. The club is made up of an array of local talent and NFD veterans, with a sprinkling of PSL experience. However, it is the freshness of the youngsters, especially the local players, that is driving the way forward. Apart from being four points above an equally desperate Ajax Cape Town, the Stellenbosch team play three of their four remaining matches at their near impregnable new home ground, the Idas Valley Stadium, and their solitary away match in Cape Town, about 45km away from their base. The Idas Valley Stadium has seen two of their most important wins, with the side defeating their nearest competitors Ajax Cape Town and Royal Eagles, all potential banana skins and virtual six-pointers. “Our goal before the start of the season was to always stay one step ahead of Ajax, because we knew they would do well and be desperate to rejoin the PSL,” continues Barker. After their game against eighth-placed Uthongathi yesterday, Stellenbosch are left with seventh-placed TS Galaxy, Cape Umoya United (11th) and finally take on the current 12th-placed Maccabi. Before this weekend’s matches, Ajax trailed the log leaders by four points, while third-placed Eagles sat on 44 points and fourth-placed Mbombela United were a further three points adrift. The run-in for Ajax and the Eagles is brutal, with the two set to face off in Round 28, meaning one or both sides will drop points. Ajax will then finish their campaign with a last-round league tie against Mbombela United. 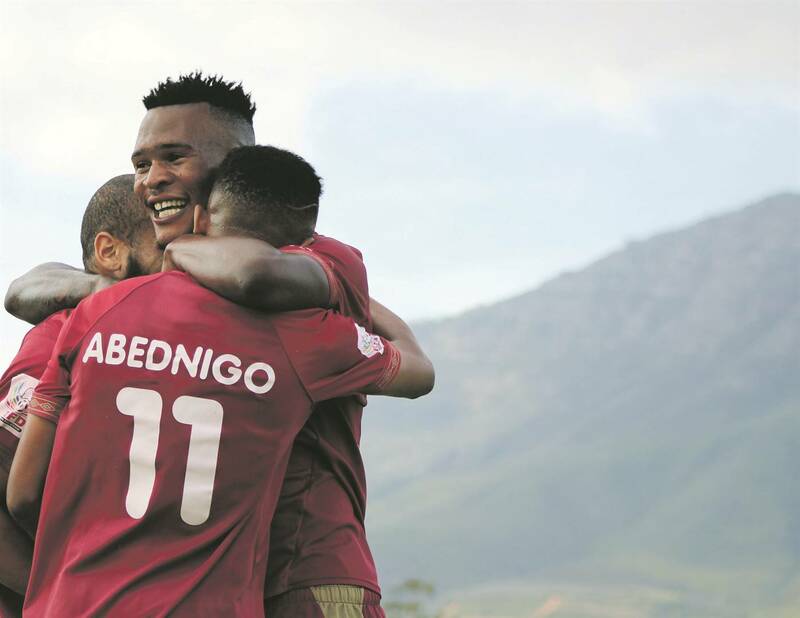 All the stars are aligned for Stellenbosch FC to earn instant promotion and, while anything can happen in football, the next three weeks could see a coronation and a blooming.